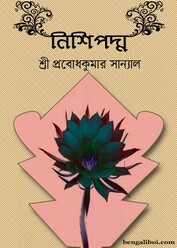 'Nishipadma' this story is about a characterless woman's fantasy and falsehood. 'Narayan' the theme of this story is describe the character of a miser and savings girl. 'Gabhir' Only one night events of a teenage chapman's life. He saved the glory and the rest of his life through the great pleasure and pain that night, that story. 'Chhandopatan' the story about the conflict and disgrace between two popular wives and men with the so-called moral sense of social and reformed people. 'Marmmokamana' a oppressed woman's anxiety to the thirst of a beautiful and noble life- the idea of this story. 'Kankal' Ancestor was the aristocratic, what is the remains in this generation? And not how much- that is the resort of this story. 'Batas Dilo Dol' a rented house. The tenant comes and goes away. A tenant leave a sport in the mind of a widowed teenager. Romance emotions of the faint girl's- the content of this story.